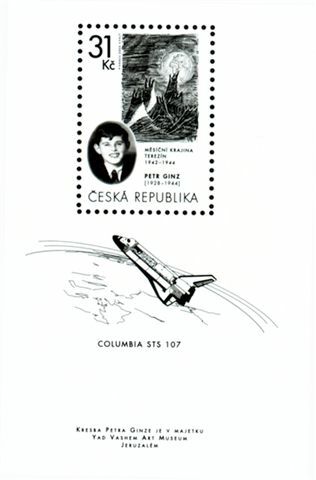 PETITION COMMEMOERATE STAMPS EDITION PETR GINZ: "LANDSCAPE FROM MOON TO PLANET EARTH"
"LANDSCAPE FROM MOON TO PLANET EARTH"
A Czech-Jewish boy of Prague was very intelligent and advanced kid retaining his aspiration to knowledge also during his stay in Theresienstadt Ghetto and later in Auschwitz concentration camp. Petr Ginz could be an example of excellent personality in these days. 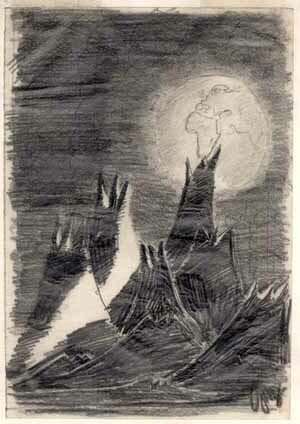 He draw before his death in a gas cell (in age of 16) many pictures and wrote notes connected with space. His drawing called “Moon Landscape” chose first Israel astronaut col. Ilan Ramon for his space trip. The flight of Columbia space shuttle having on board 2 ladies and 5 men took off on Jan. 16, 2003 at the Cape Canaveral (Florida, USA). After 16 days in space only short time before landing an accident occurred to the shuttle and its crew died. To remember the holocaust victims and space exploration casualties and to express our solidarity with survivors of all deceased astronauts we announce a petition for issue of joint-stamp issue of Czech and Israel Postal Administrations. WE PROPOSE TO ISSUE THE JOINT-STAMP ISSUE OF THE ABOVE POSTAL ADMINISTRATIONS SHOWING GINZ´S DRAWING ON SOONEST POSSIBLE OR SYMBOLICAL JUBILEE – E.G. TO COMMEMOERATE THE FIRST ANNIVERSARY OF THE COLUMBIA SPACE SHUTTLE TRAGEDY. All people agreeing with the proposal are asked to send an e-mail to address janik@japhila.com containing short message: I support issue of the commemorative stamp (or just with “Yes” ) and with their full name, town, country (and voluntarily with their profession). All messages will be archived and they will be shown to the participating postal administrations only. This is free English translation of Czech wording of the petition. If any differences in its wording to be found, the original Czech wording prevails. His drawing called “Landsape from Moon to Planet Earth” chose first Israel astronaut col. Ilan Ramon for his space trip. The flight of Columbia space shuttle having on board 2 ladies and 5 men took off on Jan. 16, 2003 at the Cape Canaveral (Florida, USA). After 16 days in space only short time before landing an accident occurred to the shuttle and its crew died. To remember the holocaust victims and space exploration casualties and to express our solidarity with survivors of all deceased astronauts we announce a petition for issue of joint-stamp issue of Czech, Israel Postal Administrations. 615 - Pettition is closed - January 20th, 2005 Stamp Petr Ginz in Czechia edit. PETICE PRO SPOLEČNOU ZNÁMKU V "mfDNES"